Painting different materials on armor video tutorial, paint over tutorial and art critique session. 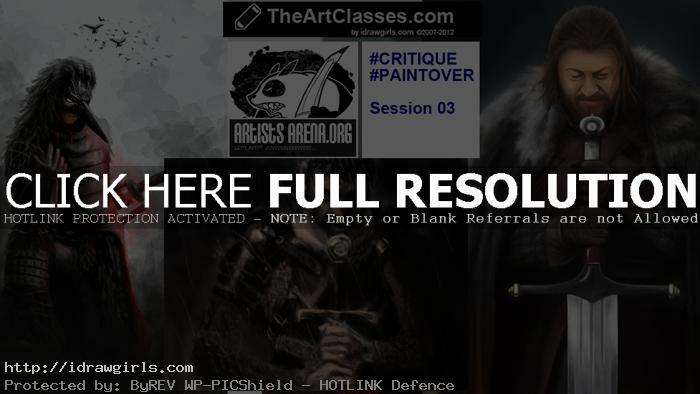 Art critique session 03 Painting different materials for armors. This is a painting tutorial and art critique in one video. Basically in this video tutorial, I talk about how different material like metal, leather, fabric and fur. Since I have over 100K subscriber on Youtube, I thought I should put together a community for artists and provide them in depth tutorials and valuable feedback. Thanks again everyone for support and encouragement, also those who cursed at me on Youtube. For artists to post their art and get feedback, you can even communicate face to face on Google Hangout. How cool is that. Thanks Google. Here is a video tutorial on how to paint different material on armors.